What’s a little urine between a couple of friends? Or, a couple of friends between urine? Either way. Life is what happens in between bathroom breaks. Is this another one of those Japanese game shows? Women between Men is next door. 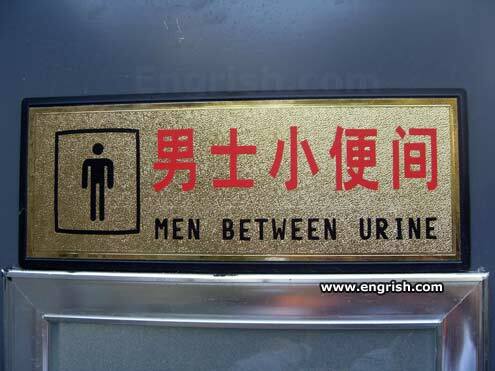 I think ‘URINE BETWEEN MEN’ sounds more logical. A: What is between men and urine? Please stay behind the yellow line until you are called. Confutius says, it’s better to get pissed off than get pissed on. A common euphemism used by plumbers to describe a major toilet leak. Talk about taking the piss. Men between urine… and urinals. Is that a warning that the urinals have no partitions? I’ve heard Men at Work and Men Without Hats, but this band is new to me. @DrZos: Not only was it shown before but many of us (myself included) made almost identical comments. The sequel to “Boys Before Flowers.” I hear it wasn’t very good. Let’s keep this between urine I. What? is that bad grammar? Let’s keep this between urine me. I’ve heard of this. I believe it’s a new reality show this Fall. Sounds like the name of an 80’s rock band. Between men and [their] urine exists a special, yet fleeting bond. me, myself, and urine. thats what life is all about. LOL.. Kinda english is that??? Man who follow Yellow Bricked Road, off to see Wizzer of Oz.